Have YOU accidentally deleted PHOTOS from your CAMERA, Card, USB Drive, Flash Drive, Or Any USB Device? These days, it's EASY for your pictures to go missing. Press a couple of wrong keys on your camera - and they're ALL gone. Or connect the memory card to your PC and press the DELETE key. Whoops! But HOW do you RECOVER those DELETED PHOTOS? Just connect your memory card to your PC, then run the program. Watch as the software scans to find your deleted photos - and then recovers them, ALL WITHIN FIVE MINUTES. 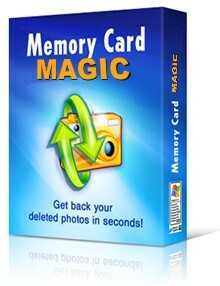 Memory Card MAGIC is GUARANTEED to recover your images. FULL SUPPORT for ALL Cards & Cameras - It doesn't matter what type of memory card or camera you're using, Memory Card MAGIC Recovery works with everything! Works with CORRUPT & Formatted Cards – Getting errors with your card? Accidentally formatted it? Don't worry. This POWERFUL Recovery Software can solve your problems! INSTANTLY PREVIEW All Recoverable Images – Scan your card and browse thumbnails of the images to recover. 100% GUARANTEED to Recover Your Photos – We promise you'll get your photos back, or we'll refund your purchase! And don't forget: Memory Card MAGIC is SO easy to use, you'll have ALL of your photos recovered within just FIVE MINUTES. Download YOUR Copy - TODAY! Do YOU want to recover your photos within the next FIVE MINUTES? 100% REFUND GUARANTEE (click here for details). Windows only. Price: $19.95. Price will be converted to local currency. Celebrate getting your deleted photos back!